This page will help guide you through account creation as well as provide information on the Endless Journey program. Also included is information on navigating the account center and the various account management functions available to players. New to Ultima Online? Check here! Those who are taking their first steps into the world of Ultima Online, we welcome you! The below section will provide you the initial steps to create an account and get started on your Endless Journey. This section is intended for those who have never played any BioWare Mythic games and have not registered for an EA Account. Click on “ULTIMA” to create your Ultima Online Account game account. EA ACCOUNT: This is your email address and what is used to log into the account management center. It contains all linked master accounts and their associated game accounts and contains your billing information. It has its own unique password. MYTHIC MASTER ACCOUNT: This gets linked or unlinked to and from the EA account. It contains any associated game accounts and has its own unique password. GAME ACCOUNT: This is used to log into the UO client and is tied to the master account. It too has its own unique password. How do I access my old account? Login assistance for our returning players. When visiting the Account Management Website- https://accounts.eamythic.com -the first page you see is the Sign In page. Returning players will need to log in using their EA account. Clicking ‘Login with your EA Account’ will redirect you to the EA account sign-in page (below) where you can then input your credentials and be redirected back to the Account Management page. 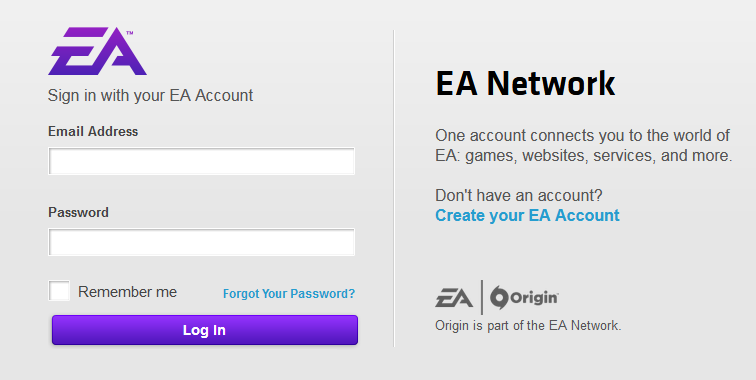 You can also create a new EA account from this same page by clicking ‘Create your EA Account’. 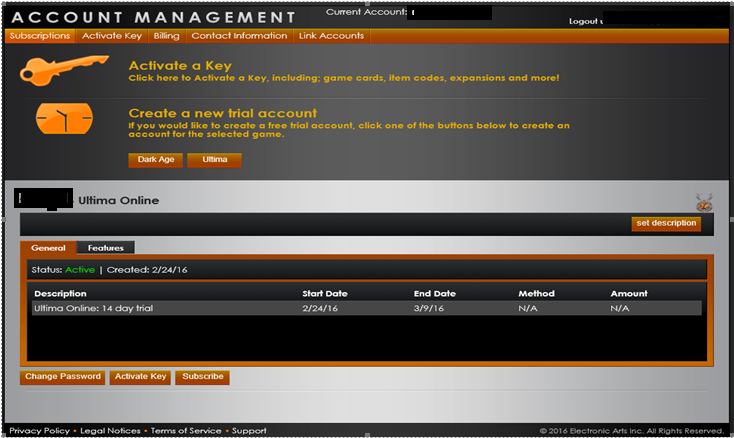 Visiting the Account Management page will now require you to log in using your EA Account. Clicking the new ‘Login with your EA Account’ option will then redirect you to the EA website to allow you to create a new EA account. Once you have created your EA Account you will be redirected to the Account Management page. You can then view or link any accounts associated with this email. You have both an active EA Account, perhaps from another EA title, as well as an older Ultima Online account you played in the past but the two have not been linked. As it pertains to logging into the account center, remember that your EA Account is your email address and your Mythic Master Account is the account name that you used to log into the Ultima Online game client. As in the previous example, all logins on the Account Center will now funnel through your EA Account. Logging in with your EA Account will redirect you to the subscriptions page where you can then view any accounts linked to the email associated with your EA Account or give you the option to link any unlinked master accounts to your email. You have an EA Account, but have never played Warhammer Online, Dark Age of Camelot or Ultima Online. You will need to create a new Ultima Online “Persona“ (master account). 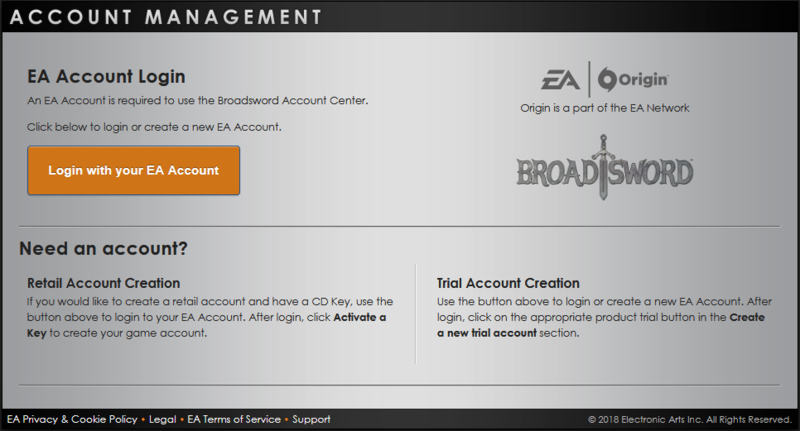 Log into the account management page using your EA Account and choose to ‘create a new trial account’ from the subscriptions page. Once you’ve successfully logged into the account center, there are a few options available to you. First of all, you can use the drop down menu to cycle between any Mythic Master Accounts/Personas you have attached to this EA Account. Once you’ve selected whichever Persona/Mythic Master Account you wish to edit or view information on, you simply need to select whichever tab you desire. Subscriptions – View Product Accounts (Game Logins) that are associated with the selected Persona. Activate Key – Activate any type of game code or key. Billing – All billing information is now protected by EA under your profile. Billing information can be updated by selecting the UPDATE RENEWAL or SUBSCRIBE buttons located under each game account. Contact Information – Contact information and other account preferences are now managed on the EA Customer Portal. Link Accounts – Allows you to link other existing Mythic Master Accounts to the logged in EA Account. When linking accounts, you must first click the “link” button. Once successfully linked, hit “Continue”. This will offer you a page to review the linking you are about to do. You then need to hit the “Confirm” button to finalize.